REDFISH LAKE - Flames lashed out at one of Idaho's most beloved locations Tuesday, threatening a fish hatchery and forcing evacuations of the nearby Buckhorn subdivision, campgrounds and the historic Redfish Lake Lodge. The 210 Road Fire ignited Monday afternoon on state land close to the Sawtooth Fish Hatchery near Idaho 75, and it reached 300 acres by Tuesday afternoon. The blaze was just one of 11 burning statewide Tuesday, with more than 1,000 firefighters, fire managers and support staff assigned to the various fires. 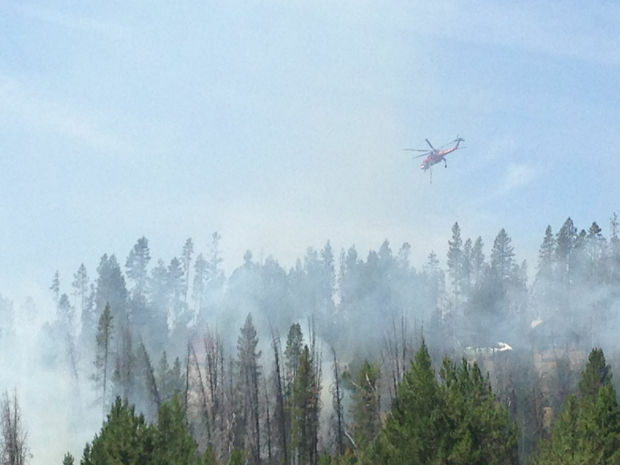 Not far from the Sawtooth hatchery, firefighters manned helicopters to protect a row of houses and yurts Tuesday. The fire consumed the beetle-killed trees Monday night, but copters were dropping water to defend against small, advancing flames. Nearby campsites remained vacant, and empty tents flapped from the gusts of wind the helicopter produced. An evacuation order for the lodge and some houses remained in effect Tuesday. "The lodge and the campgrounds were not immediately threatened," fire spokeswoman Linda Steinhaus said. "The evacuation was really all about public safety at the time." Stacey Clark, spokeswoman with the U.S. Forest Service, said campers were being allowed to retrieve stuff left behind Monday. When the blaze burned to the edge of the fish hatchery, which includes dormitories and nearby residences, inhabitants fled temporarily. The fire burned through a stand of trees separating the dorms from residences. Fenceposts lay broken and charred, but the fire somehow did not destroy any structures. The visitors center at the hatchery, which raises chinook and sockeye salmon, will remain closed until further notice. An elite Type 1 command staff was summoned to take over at the fire. Nearly 250 fire personnel are helping contain and manage the blaze, Clark said. Along with helicopters and an air tanker, four Hotshot crews, four hand crews and 18 engines had responded. Smoke was no longer billowing into a single column but dispersed throughout Stanley and trailed 60 miles south into Ketchum on Tuesday. Firefighters aren't estimating when they can contain the fire, as it burns dry and dead lodgepole pine along with plenty of brush. They had come Monday afternoon to camp, but by the time they reached Redfish Lake, the smoke had kidnapped the sky, and paths to the lake were closed. Flames jumped Idaho 75 on Monday night, forcing the highway's closure. Although the road reopened Tuesday, officials said motorists should call the highway department before traveling to the area.